Biona Shape is the combination of natural herbs which help in maintaining good shape by losing extra fat responsible for the weight gain. The active constituent is Banaba Leaf Extract that is active glucose transport enhancer and balances blood sugar levels thereby reducing cravings for sweets and carbohydrates. Wheat Amylase inhibitor prevents excess carbohydrate metabolism and prevents extra fat deposition. The epigallocatechins in green tea extract improve energy production and regulate fat metabolism and helps burning extra fats. Chromium increases insulin sensitivity. 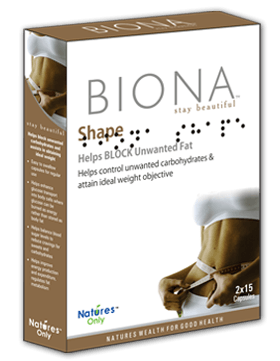 Therefore, Biona Shape is a natural formula which helps block unwanted carbohydrates and assists in obtaining desired weight without any serious side effects. BIONA is an excellent example of our ambition to bring the best of natural technology to each category we serve. Amylase inhibitors are commonly known as starch blockers because they contain substances that prevent dietary starches from being absorbed by the body. They also induce carbohydrate tolerance and satiety (a feeling of fullness) through delayed gastric emptying and weight loss. Green tea contains powerful antioxidants called catechin polyphenols that are responsible for the health benefits of green tea. One of them in particular, epigallocatechin gallate (EGCG ) has been found to stimulate the metabolism and accelerate weight loss. EGCG, along with the caffeine in green tea, stimulates central nervous system and causes fat to be released into the blood stream for the body to use as fuel. This process of fat being used for energy is called "thermogenesis". It provides extra energy, sheds excess water, and also helps to burn body fat. Although caffeine alone can stimulate the metabolism this way, it's important to note that researchers found that the combined ingredients of green tea were much more effective at this process than just caffeine by itself. Green tea contains powerful antioxidants called catechin polyphenols that are responsible for the health benefits of green tea. One of them in particular, epigallocatechin gallate (EGCG ) has been found to sChromium is essential for sugar metabolism in the body. It plays a key role in increasing the body's sensitivity to insulin. Chromium supplementation would be quite beneficial in people trying to lose weight because increasing insulin sensitivity is a critical step in promoting weight loss.